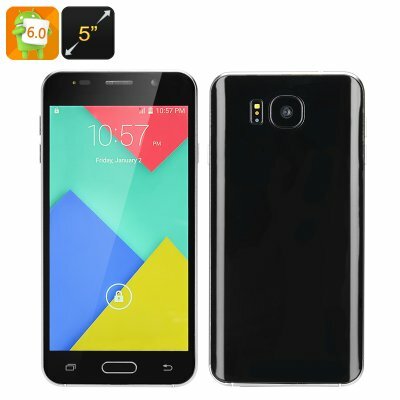 Successfully Added Android 6.0 Smartphone - 5 Inch IPS Screen, Quad Core CPU, Smart Wake, 64GB SD Storage, Dual SIM (Black) to your Shopping Cart. With its quad core CPU this isn't the fastest phone around but it's certainly good enough for all your daily needs and running Android 6.0 has all the functionality you'll require for call management, messages, surfing the web and keeping updated on social media. Featuring two SIM card slots lets you separate work and personal contacts and keep both numbers active on this one nifty Smartphone. This budget phone has a 5 inch 720p IPS screen that brings a rich color palette and bright easy viewable display that is perfect for movies, videos and surfing the web. A modest 4GB or memory can be supplemented with the micros SD card slot that allows an addition 64GB of storage. This should be more than enough for the largest mobile media libraries letting you take a wealth of entertainment whenever you go. The phone is equipped with an efficient 2200mAh battery, for longer viewing times, and prolonged daily usage that allows 12 hours of talk time when fully cahrged. respectable front and rear cameras with interpolation offer up to 12 MP photos and can easily record video in 720|P so capturing those magical moments for posterity sake is fun and easy. Running on Android marshmallow 6.0 allows you to enjoy all the latest updated from Google's newest operating system and with smart wake functions navigation couldn't be easier. Just draw a pre set character on the screen to open the phones more frequently used apps. This Android 6.0 Smartphone comes with a 12 months warranty and is brought to you by the leader in electronic devices as well as wholesale Android phones..